Michael Collins' dazzling virtuosity and sensitive musicianship have earned him recognition as one of today’s most distinguished artists and a leading exponent of his instrument. At 16 he won the woodwind prize in the first BBC Young Musician of the Year Competition, going on to make his US debut at New York’s Carnegie Hall at the age of 22. He has since performed as soloist with many of the world’s most significant orchestras and formed strong links with leading conductors. Collins also has the distinction of being the most frequently invited wind soloist to the BBC Proms, including several appearances at the renowned Last Night of the Proms. In recent seasons Collins has become increasingly highly regarded as a conductor and in September 2010 took the position of Principal Conductor of the City of London Sinfonia. His success in this role is testament to the natural musicianship and galvanising leadership that is evident in both his playing and conducting. In recent seasons, his conducting highlights have included engagements with the Philharmonia, Academy of St Martin in the Fields, London Mozart Players, BBC Scottish Symphony Orchestra, Ulster Orchestra, Kymi Sinfonietta, Auckland Philharmonia and Tasmanian Symphony Orchestra. In 2007, Collins received the Royal Philharmonic Society’s Instrumentalist of the Year Award, placing him amongst past recipients of the award such as Itzhak Perlman, Mitsuko Uchida, Murray Perahia and Andras Schiff. The award was made in recognition of the pivotal role that Collins has played in expanding the clarinet repertoire, commissioning and premièring repertoire by some of today’s most highly regarded composers. He has given world and local premières of John Adams’ Gnarly Buttons, Elliott Carter’s Clarinet Concerto, Brett Dean’s Ariel’s Music and Turnage’s Riffs and Refrains, which was commissioned by the Hallé Orchestra. Collins has gone on to perform Turnage’s work with the Residentie Orkest, Royal Flanders Philharmonic, Helsinki Philharmonic and London Philharmonic orchestras. In 2009 he appeared at New York’s Mostly Mozart festival, performing Gnarly Buttons under the baton of the composer. In 2008, Collins gave the world première of Elena Kats-Chernin’s clarinet concerto Ornamental Air with the North Carolina Symphony Orchestra and last season released a recording of the work on the Chandos label with the Swedish Chamber Orchestra. In great demand as a chamber musician, Collins performs with musical colleagues such as the Belcea and Takács quartets, Martha Argerich, Stephen Hough, Mikhail Pletnev, Lars Vogt, Joshua Bell and Steven Isserlis. His Residency at Wigmore Hall saw him in performance with András Schiff, Piers Lane and the Endellion String Quartet. His ensemble, London Winds, celebrates its twenty-fifth anniversary in 2013, with entirely unchanged membership during that time. The group maintains a busy diary with high calibre engagements such as the BBC Proms, Aldeburgh Festival, Edinburgh Festival, City of London Festival, Cheltenham International Festival and Bath Mozartfest. Collins is also Artist Director of the Liberation International Music Festival in Jersey. With a prolific discography, Collins is signed exclusively to Chandos Records and consistently receives the highest critical acclaim for his recordings. His most recent release is British Clarinet Sonatas Vol. 2, recorded with pianist Michael McHale and released in February 2013. Last season, Collins released a disc of British Clarinet Concertos Vol.1, which he play/directed with the BBC Symphony Orchestra. 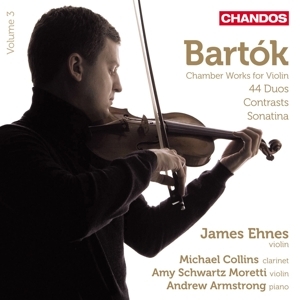 Collins’s 50th Birthday was celebrated with a Chandos release of Weber Concertos conducted and performed by himself with the City of London Sinfonia. Michael Collins plays exclusively on Yamaha clarinets.